This a hearty but bright side dish/salad that is beautiful to boot. The tang of the green tomatoes offsets the sweetness of the squash. Put the lentils in a saucepan and cover with water by 2 inches. Add 1 teaspoon salt, bring to a boil, turn down to a simmer, partially cover and cook for about 17-18 minutes or until just tender but still mostly holding their shape. Drain and set aside. Cover the bottom of a large, heavy skillet with a slick of olive oil and set over high heat. Add the diced squash. Sprinkle with salt and then cover and cook undisturbed for a few minutes. Turn the heat down to medium high. Cook, turning the pieces occasionally to evenly brown them until they are tender but not falling apart, about 8-10 minutes. Set your oven to broil and spread the diced green tomatoes on a baking sheet. Sprinkle with salt and drizzle with a bit of olive oil and put under the broiler. Under my broiler it took about 10 minutes to soften them a bit and get a nice browning on one side. No need to flip and disturb them. You want them to keep their shape and integrity, if possible. In a small bowl mix together the balsamic vinegar, olive oil, salt and pepper. 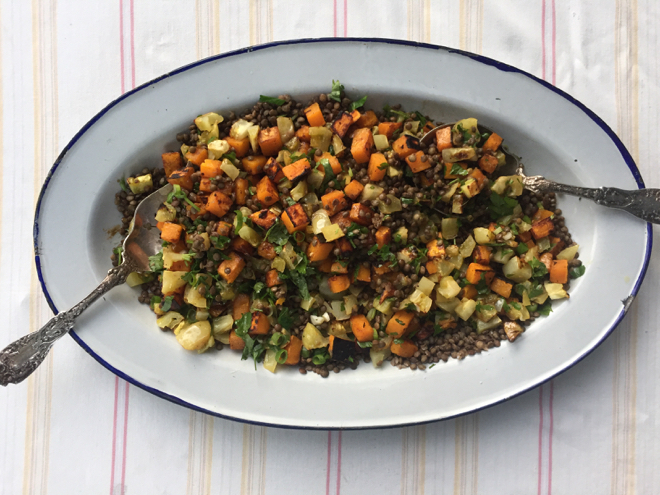 Spread the lentils on a platter or in a wide bowl and toss with one third of the dressing. Top them with the squash, tomatoes, herbs and scallions. Drizzle the remaining dressing over it all and gently toss. Taste and adjust seasoning as you see fit. Serve warm or at room temperature.